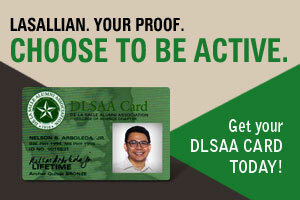 The DLSAA Lasallian Achievement Award honors alumni who have achieved either industrial, managerial, professional, avocational, or public service distinction or series of distinctions. This award category is dissimilar to the DLSAA Distinguished Lasallian Award in two main aspects: (1) It focuses more on the singular distinctive achievements of the awardee in a single area and, accordingly, principally focuses on tasks rather on the persons and (2) The award does not have a minimum 20-year award lapse. Alcasid, Herminio "Ogie" L. Jr.
Alindogan, Antonino “Nonoy” L., Jr.
Dalisay, Jose “Butch” Y. Jr.
De Guzman, Renato "Bing" T.
De Los Reyes, Geronimo B. Jr.
de Mesa, Teodoro Maximiliano M.